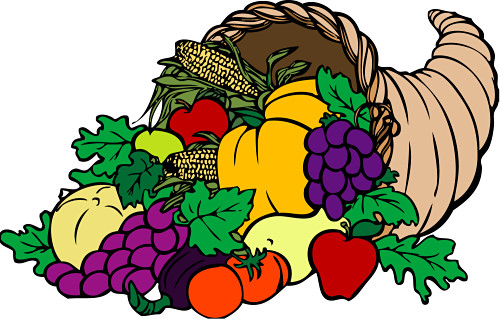 Everyone in the US and Canada celebrates the holiday of Thanksgiving, although on different dates. Traditionally, as all children learn in grade school, in the US this holiday celebrates the Pilgrims being helped by the Indians to survive and a feast they jointly held in Plymouth, Massachusetts in 1621. There is a lot of debate about that event, whether it happened or not, but I think it’s actually irrelevant. More important is what Thanksgiving has morphed into, what it is today. It’s a family day, often more so than Christmas, especially in the northern climates. In my family, and many others, at Thanksgiving you see more extended family than at Christmas, where Christmas is more immediate family. In the North, travel has become difficult or iffy at best by the end of December, but the end of November generally is still safe. Now that I’ve said that of course we’ll have a blizzard. Thanksgiving is the time when my Aunt Verma inadvertently spilled the beans on the “skeleton in the closet” at the dinner table. You could have heard a pin drop. Well, before the gasps. Thanksgiving is the time to ask about those ancestors or family members, even if you think you know the answer. Because, you may not. Often, it’s for lack of asking the question or introducing the subject that you don’t learn those stories. Probably the number one regret of genealogists is that they never reached out when they could. Today, reaching out isn’t just across the dinner table or while doing dishes, a favorite time to pick the brains of your relatives, it’s about reaching out using new technology. If you could make contact with someone who has photos of your great-grandmother, wouldn’t you want to do that? How about someone who has a copy of the family Bible owned by your Revolutionary War ancestor? Maybe a tin type and journal of your Civil War ancestor. Who has those today? Maybe you don’t even know they exist. If they aren’t in your family, it will take a new form of reaching out to find them. I’ve celebrated Thanksgiving this week by reaching out to the younger generation. I don’t mean to stereotype, but let’s face it, you’ll never meet these people on Rootsweb. Where do you find them? Facebook, that’s where. Want to find out what pictures their grandma has in the attic? Well, you have to make contact with them so they will ask their grandma, or tell their grandma to check out your Facebook page. And yes, more and more, grandma is using Facebook. Now stop groaning. I can hear you from here! I know, I groaned too. But I did it anyway. We need to interest young people. They can DNA test and someday, maybe one of them will be who you pass the proverbial family torch to. If you’re like me, it’s not one of your kids, no matter how badly you want it to be. I think I burned them out in courthouses at the copy machine when they were kids. My bad. This is not difficult. If you are not on Facebook, summon up your courage and go to www.facebook.com and sign up. If you are already on Facebook, skip down 2 or 3 paragraphs to the section on setting up pages and groups. If you’re really uncertain, you can google about how to get started using Facebook, but it’s actually really easy and intuitive. You want to be on Facebook because your kids and grandkids are there and you’re going to lose touch with them and how they communicate if you don’t join. Just do it. Once you join, just type names into the top bar to look for your friends and family, where it says “search for people, places and things.” Then send them a friend request. You’ll see the “Friend” button, just click on it. This isn’t difficult, you just need to get used to it. 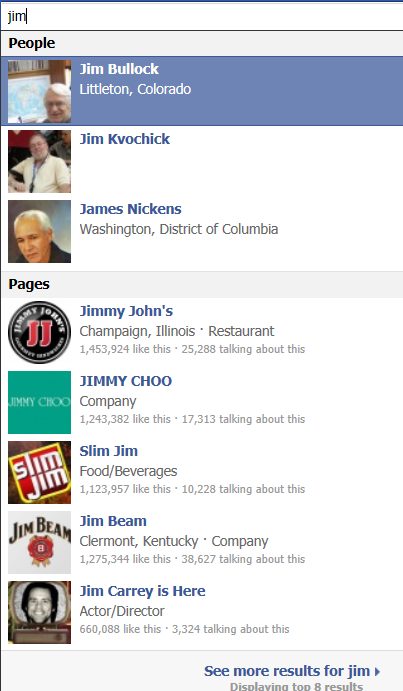 Here are the results when I searched for Jim. Once you are a friend, you will see what they put on their timeline and their status posts. These include photos and such. I see new photos of my grandkids just about every day. Your news feed aggregates all of the people and projects that you are following. Of course, you’ll want to post something, eventually, yourself. The best way to get a conversation started is to ask questions, just like at Thanksgiving. On Facebook, you do that by typing something in the field that says “What’s on your mind?” Facebook is one big informal conversation. After you get at least a little comfortable with Facebook and your News Feed, you’ll want to set up either a project group or a page. Here’s what I did. And by the way, I am not “comfortable” with Facebook but I just did this anyway. The only way to get comfortable is to work with the software. I set up two pages and I’m going to set up project groups. My new pages are ”DNAexplain” and “Native Heritage Project.” You will have to type those names (minus the quotes) in the search bar at the top of the page at Facebook to find them. That’s how Facebook works. Then you click on the image and then click on “like” to connect yourself to them. So please, do me a favor and “like” both of them. Facebook requires 25 likes for a new group or page to be recognized as legitimate. Pages are public. They are generally for entities, meaning businesses and organizations. You might want to put a family association there. ISOGG (International Society of Genetic Genealogists) is there, for example, as is the Lost Colony Research Group. Everything posted on these pages is available for everyone to see. Groups can be set up to be entirely public, private or secret, meaning by invitation only. Facebook has a help page that discusses these differences. Groups are generally for more personal discussions. For example, you might choose to form a “by invitation only” intimate family group. You might choose to set up a Page to advertise your family association and to attract people who are interested in addition to a group for more private discussions. Remember, the whole point of this exercise it to reach out, so the more public your presence, the better chance you’ll have of attracting interested people. Be aware however, that these pages are not text searchable and do not have archives like Yahoo Groups or Rootsweb. But then again, this is for reaching out, not archiving. To create a page, which is what I recommend for surname projects, scroll all the way down to the bottom of your Facebook page and click where it says, “create a page.” From there on, Facebook guides you. To create a group, on the left hand banner, Facebook will show you any groups you are a member of, and at the bottom of the list, it says “create groups.” Click there and again, Facebook guides you through the rest. Here is my commitment. If a Facebook page or group does not exist for each one of my DNA surname or other pet projects, I’ll create one by year end. Yes, this year, 2012. There is nothing like the present moment. I’m reaching out to the next generation. After all, the old folks are gone now, so I need new information targets:) Who knows what I’ll find, but if I don’t reach out and try, I’ll find absolutely nothing! I want more family information to be thankful for by next Thanksgiving!!! I want to honor those who have gone before by preserving the information about their life. That is what heritage is. How about you? How can you reach out and what do you hope to find? This entry was posted in Education, Projects, Tools and tagged Examples by Roberta Estes. Bookmark the permalink. That was a really good post. Thanks giving has become an American tradition. But the ideas behind it – of two cultures celebrating a common meal together – a coming together of cultures, one an old world and one from a new world, is more important. In a multicultural society, maybe we should look at Thanks giving as more than just a holiday, but as two cultures coming together for the common purpose of survival. Maybe that should be the real celebration behind thanks giving. Just a thought. But as i said, really good post. Roberta, I’m looking forward to seeing your new Facebook pages! It’s true, surname study projects, genealogical organizations, genealogy blogs, and others need to get their word out via Facebook, as well as the other social media. I’m not sure whether this insures targeting a younger audience–face it, even you admitted grandmas are on Facebook now, and savvy younger researchers know how to find other genealogy aficionados online in all our usual old-time haunts–but it does end up targeting different groups of people. It’s just a matter of simultaneously using multiple venues to talk to several different crowds. The more we expand our networks, the more likely we’ll be to connect with the people and information we’re seeking. I just wanted to say that I have had very good success with my Proctor DNA Study page on Facebook. I have 84 members now, including many “younger” participants. I’m not even sure how many of them have found it. We have had great conversations there, resulting in many being inspired to test and officially join the DNA project. Therefore, I enthusiastically support your efforts! Tanks, I’m going to do that today. Happy Thanksgiving Day to you and your family. 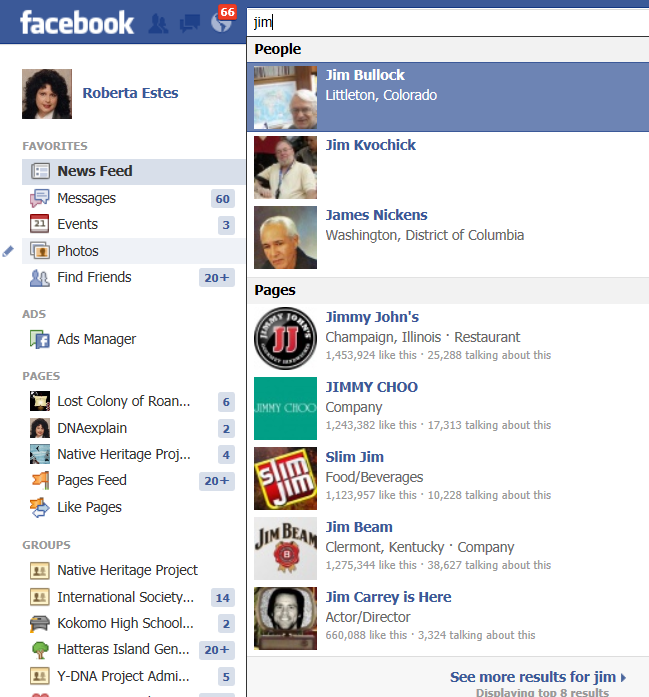 Facebook also keeps you in contact with cousins, nieces and nephews that you would never know. On Facebook – but no projects there yet. WHAT did Aunt Verma say?